Never Never was formed in 1987 out of the post-Ravyns (Raised on the Radio) project, Rob Fahey's Word of Mouth. 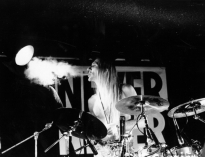 Kevin 'Spike' Settles played drums and sang in several of the Girard's-era new wave bands (L7 and Lab Animals) and on many nights opened for his future bandmates. (Girard’s was a popular downtown nightclub of the time.) In Word of Mouth, Spike played drums and handled many of the high vocal harmonies and a few lead vocals, and occasionally fronted the band while someone sat in on drums. Word of Mouth guitarist (and former Ravyn) David Bell approached Spike on New Year's Eve, 1987, about fronting a new band that would write some songs and cover all the coolest 70's bands: mostly Led Zeppelin, but also Aerosmith, Van Halen, Bad Co., Doors, etc. It was originally conceived as a "for fun" project. David had a name for the new band: Never Never. Former Ravyn Lee Townsend was recruited to play bass. His 'southpaw but strung right-handed' melodic style was deeply rooted in the Beatles and Cream, making him the most authentic choice for the bass guitar chair. It was a perfect fit. The search was on for a drummer who could handle the heavy Zeppelin list. While auditioning drummers, the band appeared as a trio at their first gig (The 15-Mile House in Reisterstown) with Spike on drums and lead vocals. (Note: David and Spike were also still playing with Word of Mouth at the time). Tim Steele (also a former Ravyn with heavy 70's Cream/Zeppelin roots) had been asked to join the band. He was skeptical, but the Zeppelin list lured him out to the second gig and by the second set that night, he was a member of group. With the line-up complete, Never Never began to play weeknights that weren't filled by the Word of Mouth schedule. The new line-up had much more crowd draw than anticipated. Packed Wednesdays at the 15-Mile House and Thursdays at the Dulaney Inn were testament to the addictive quality the group had. The new group quickly went into High Heel Recording Studio to record their first original songs. It was obvious that the four had great musical chemistry. When Rob Fahey decided to move to Los Angeles to pursue his music career, Word of Mouth disbanded, and Never Never eagerly took on a full-time schedule. The band became one of the top area club bands in its first few months of playing. 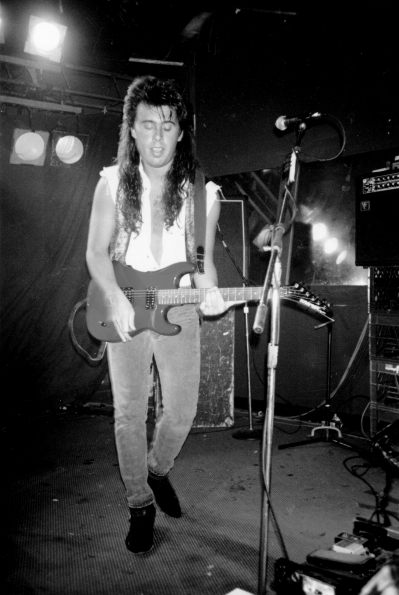 In late 1988, original guitarist David Bell left the band to move to Huntington Beach, California to pursue a music career. The guitar slot was temporarily filled by Tony Sciuto, a long-time veteran of the east and west coast music scenes. 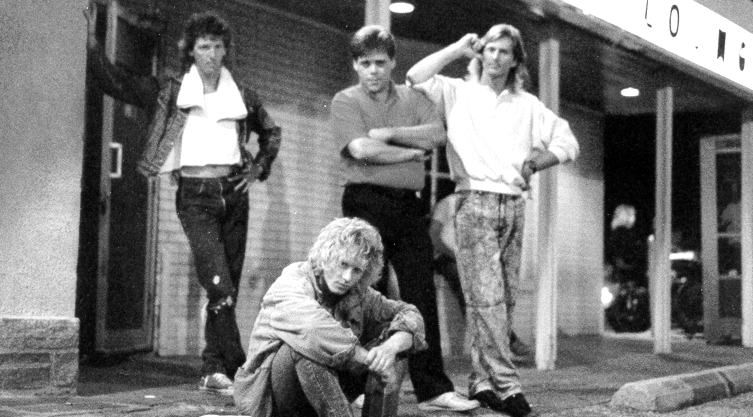 Tony was very involved in the LA songwriting scene and joined the band temporarily under the condition that they search for a permanent replacement. The search ended five months later. Ron Zebron was the first guitarist to come along in years to make the veteran guitar players on the scene stop and take notice. He had been the first choice to replace Bell but wasn’t sure if this new band had the goods to make the living he had become accustomed to. He'd spent the last few years playing in full-time dance/top-forty bands. Ron was invited to come to the 15-Mile House and sit in one night and was hooked. He took over guitar duties in late 1988. With the chemistry stronger than ever, the foursome began to make its mark on the local music scene. The new chemistry with Ronnie on guitar lived up to the public's already very high expectations of the Never Never sound. The band was playing a full schedule, writing songs and expanding the song list very quickly with the new line-up. Never Never enjoyed all the privileges of a seasoned rock and roll band such as full road crew, and the pro sound and lights needed to play the large clubs. Duane Regula mixed sound and provided commentary throughout most of this period. Spike's voice proved capable of handling the difficult song list and schedule. The Never Never machine made it look easy to the amazement of many who either struggled to start bands, or said that the scene wouldn't support such a band. Hurricane in my Heart was the first full-length CD effort by the group. Financed by club owner, fan, and good friend Doug Adkins, the disk includes ten original songs and one cover (of the Terry Reid song; Lovin' Time). The quality songwriting on the out-of-print disk is strong enough that the less-than-desirable sound quality doesn't detract from the legitimacy of this effort. It's still a coveted addition to many a die-hard Never Never fan's collection. It was also during this period that the "gate" band photo was shot. Originally slated as the cover for the CD, it was used on the inside instead. This portrait captured the essence of the group during this period: focused, together, legitimate. Never Never was starting to suffer from the politics of the music. Agency wars, club owners and managers were making it increasingly difficult for the group to do what it did best--play for the people who loved the band. Overexposure in some areas, underexposure in others, combined with the constant stress of a full-time band and all the excesses that go with it, were taking their toll. In 1994, after a Christmas visit to California, Spike made the decision to leave the group and move to San Francisco to try to establish himself in the west coast music scene. The band briefly looked for a singer, but no suitable replacement was found. The band played its farewell gigs in early spring '94. It was during this period that Ron would join a band that would play a crucial role in the continuation of Never Never. Zebron was an assembly of top-notch talent headed by Ron and Cathy Zebron, husband and wife team, musicians extraordinaire. Cathy handled lead vocals and played keyboards and guitar. Ronnie played lead guitar and sang. The rhythm section was Angelo Cammarata on bass and John Thomakos on drums. Drummer Tim Steele helped out by filling in when John couldn't play, but soon moved to Tampa, Florida. Zebron would play through most of '94-'95 before disbanding. Spike's California experience was cut short. He was starting to audition for bands and move in the scene but lack of funds made staying impossible. He missed singing with his friends and soon he was on his way back east. Dave Rode, Spike’s close friend and long-time supporter of Never Never, volunteered to help organize and book Spike’s next project. Spike and the Pipefitters worked up a song list heavy on Pink Floyd, Who, Neil Young, Zeppelin, Doors and Bad Co., and started playing the clubs. The band was Sandy Cormack on guitar, Phil Anderson on bass, Dave Loughoff on drums and Spike on vocals, guitar, keyboards, and harmonica. Just as they were starting to play out, professional differences temporarily sidelined the effort. Spike and Sandy enlisted the help of Lee Townsend to take over on bass and Edgar Meyers to play drums and the band started playing again. Several of the clubs began to express an interest in a Never Never reunion. With the help of Dave Rode, three shows were scheduled. The Zu in Dundalk hosted the first two shows. Both were a huge success. The third show was in Ocean City at the new "Scandals" (now occupying the old "Samanthas" on 45th street.) The O.C. show was marginally successful for the room (now a dance club), but was a huge success for the band. This series of shows re-ignited the fire and it was agreed by all parties concerned that Never Never still had the magic chemistry and should consider reforming permanently. Spike and Lee Townsend were playing with the Pipefitters only on weekend nights due to the schedule limitations of the players with day jobs. Ron Zebron had been filling in the lead guitar slot in The Brian Jack Band and was ready to play with the Nevers again. Tim Steele was ready to move back from Florida. Under new management with Dave Rode, the foursome began to play to an audience that was hungry for Never Never. When Lee Townsend left the group in September, 1996, the search was on for a new bassist. Angelo "AJ" Cammarata had been working with Ronnie for years. He was the bassist in Zebron. He and Ronnie had also worked together in The Brian Jack Band. Angelo's experience, easy-going nature, and schooled bass guitar style made him the natural choice for Never Never. During this period, the band worked with local producer Drew Mazurek on a studio project that was to be the new CD release, complete with a remake of "Nobody's Fault But Mine". The sessions proved successful even though the band never released the final product. Tim Steele tendered his resignation in April of 1998. Manager Dave Rode also left. Ron, Spike, and AJ began auditioning drummers. The search didn’t take long. Sherry Band assumed the management duties and the Nevers landed on their feet again. Shawn Hughes was a different drummer. He came from a background of 80's metal and old school hip-hop. Shawn knew what it was like to work a full-time schedule, having just spent two years playing in one the longest-standing, travelling full-time bands to ever work a club: Great Train Robbery. He was stoked to play the challenging Never Never song list. His aggressive sound and style added a whole other dimension to the classic Never Never sound. 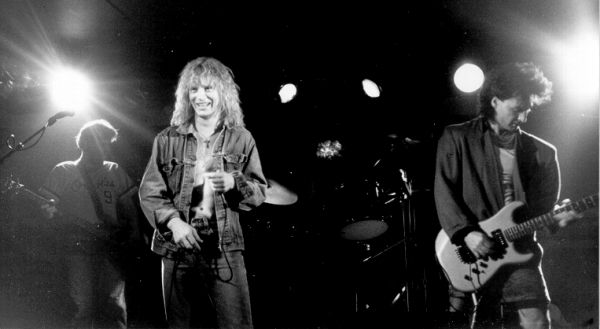 Along with the Zeppelin songs (that now had a heavier, modern sound), the band also added many early Black Sabbath and Van Halen songs to their song list during Shawn’s tenure as drummer. Shawn was a very high-energy person. If he was not immersed in the pressure of the gig (which he handled with ease), he found other less fortunate ways to spend his time. 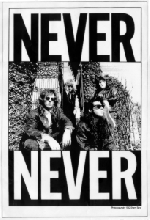 Although he didn't stay with the band long, they were able to record and release an EP-length CD that captured the power of this incarnation of the band: Never Never 1998. It is also a continuation of the band’s work with Drew Mazurek at the controls. Spike and Ron continued working with a variety of top-notch drummers and bassists. Erik Krakau began filling dates with the band in 2003, and in June 2007 he became the band's full-time bassist. In October, 2007, longtime guitarist Ron Zebron moved to Tampa, Florida with his new wife and is pursuing other interests. He returned to Baltimore to play one last gig with the band on New Year's Eve-Eve, 2007. We wish him all the best. In 2008, they added a new show to their repertoire: An all-Zeppelin show with good friend Brian Comotto on keyboards. Currently, original guitarist David Bell is still with the band. Erik Krakau plays bass. John Davis and Nick Bertling share the drumming duties and Spike handles the vocals, harmonica, and rhythm guitar. 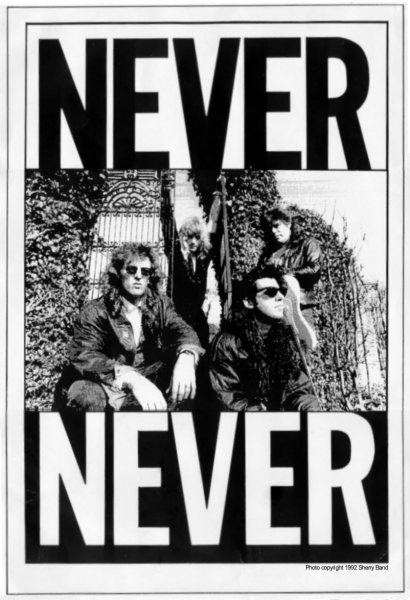 Never Never continues to play great rock music. They will always be grateful to the many people who have contributed to their success over the years, especially their fans. Copyright © 1999 - 2009 Never Never. All Rights Reserved.